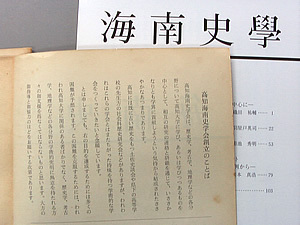 KOCHI KAINAN SHIGAKU-KAI (The Kochi Kainan Society for Historical Research) was founded in January, 1963. Former students, undergrads and teaching staff in the then Faculty of Humanities and Sciences (BUNRIGAKUBU) of Kochi University played a crucial role in the society's foundation. Its singular function, however, is as an academic society rather than an alumni association, and its mission is "the promotion of research about history and its relevant fields and the propagation of its knowledge". The Society holds an annual general meeting, colloquiums and seminars, and publishes the Journal of Historical Research, Kainan Shigaku. The journal has excellent articles which are highly regarded among academic historians. Copyright © 高知海南史学会. All Rights Reserved.